With its quaint downtown, eclectic townspeople, and friendly atmosphere, Allan and I quickly decided to make Wake Forest our home. 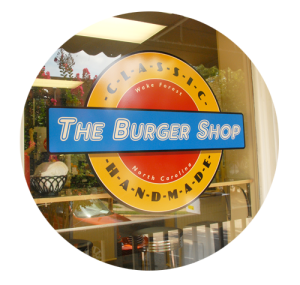 We then began transforming a small corner shop into a classic burger joint; a shop previously known for more than 50 years as The Barber Shop, where Mr. Harding would cut your hair and folks would gather. Seeming a fitting tribute, we decided to name our place, The Burger Shop. We strive to serve a simple but delicious burger at a good price. It has been our pleasure serving Wake Forest thus far, and we aim to continue for many years to come. When in town please stop in to say hello or perhaps enjoy a hand-squeezed lemon or orangeade with your burger and fries.